He’s being looked at as he turns into the street, leaning on his hand cart laden with sunflower seeds. Bandage around his head, unsteady on his feet. He coughs. The people in the street laugh. Damn, there he is again! Diyarbakir, capital of the Kurds, south-eastern Turkey. Don’t ask what year it is, it could be 1992, 1995,or even 1998. For newspaper boy, or more precisely newspaper man, Yakut Yilmaz, the years are totally interchangeable. The number of times he takes out his hand cart and hides his real merchandise under a pile of sunflower seeds, uncountable. Sometimes he hits the road with a head injury, sometimes with damaged arms or legs, for years even with only half his teeth. For him only one thing counts: deliver the paper to whoever wants to read it. ‘Ah, there you are. Come, let me open the door, and then we can start the investigation.’ It’s not a daily routine that an army of policemen gathers in front of the office of Özgür Gündem in Ankara. Nevertheless, editor in chief Hüseyin Aykol isn’t surprised at all: from the paper’s very beginning in May 1992, nineteen years ago, there hasn’t been a quiet moment. Court cases, fines, journalists and distributors arrested, murders, bombs even. So a search of the editorial office – what can he do? The policemen obviously expected something other than a cooperative editor in chief. After the policeman in charge has checked Aykol’s identity, the editor in chief gets handed the keys to the new lock. It has just been installed, replacing the old one broken when the anonymous-looking steel door was forced open. Behind that steel door on the first floor in the right-hand back corner Ozgür Gündem’s Ankara editorial office is situated. Editor in chief Aykol works alone there: the central office is in Istanbul. To the left of the hallway a bigger space: the office of Dicle Haber Ajans, DIHA in short, a Kurdish news agency named after the Dicle, the river Tigris in English. Their room too is being searched, and their books, papers and computers are being taken away. In the meantime, the phone starts to ring again and again. Izmir is calling, Diyarbakir, Istanbul, Urfa. Aykol hears that all over the country in the early morning journalists of Kurdish media are being dragged from their beds, and offices and houses are being searched. While Aykol sees the equipment he needs to publish tomorrow’s paper disappear off to the police station, he hears that part of his team is no longer available: nine of his journalists are in custody. They work for the daily paper and for some magazines of the same publisher. A total of 44 journalists are taken into custody that day. Most of them work for DIHA, Özgür Gündem (Free Agenda) and the only Kurdish language paper in Turkey, Azadiya Welat (Free Country), others for smaller Kurdish media. Among the arrested are also a few people of the distribution agency used by Kurdish media. They were detained as part of the so-called ‘KCK operation’. KCK is the union of communities in Kurdistan, an umbrella organisation of Kurdish organizations in Turkey, Iraq, Iran and Syria. PKK leader Öcalan, who is serving a life sentence on the prison island of Imrali, leads the KCK, and Murat Karayilan, PKK commander in the mountains on the Turkey-Iraq border, is on the board. Since 2009 thousands of politically active Kurds have been detained for ‘being a member of an illegal organization’. Among them mayors and civil servants of municipalities that are governed by the BDP, students, academics and human rights activists. The journalists allegedly formed the ‘press group’ of the KCK. Why did you attend that press conference? There is no evidence against the thousands of KCK suspects. Indictments are full of (illegally) wiretapped phone conversations the subject of which might be the time a meeting starts and who determines its agenda, or somebody not being able to come because of illness, or that somebody will have to bring some food to the meeting. All secret language, according to the prosecutor, in which ‘tomatoes’ are really ‘explosives’. As well, books found at the suspects’ homes or offices are used as evidence. Legal activities are brought forward as evidence of ‘membership of the KCK’, the reports of interrogations show. Why did you visit wounded protesters in the hospital? Why did you attend that press conference? Why did you shout that slogan? By both those involved as well as independent international and Turkish human rights organizations the KCK trials are considered some of the biggest show trials in Turkish history. The fire is almost out. This time, thinks Aykol as he approaches the Istanbul editorial office of Özgür Gündem on foot and sees the smoke coming out of the building, they have succeeded. Our work will stop. The paper survived arrests, killings, publication bans and fines, but bombs, let off simultaneously at the offices in Ankara and Istanbul, that is too much for the resilience of the paper. He walks around numb among the curious crowd gathered to watch the flames. He doesn’t recognize anybody he knows. Aykol is, just like anybody else, kept at a distance. 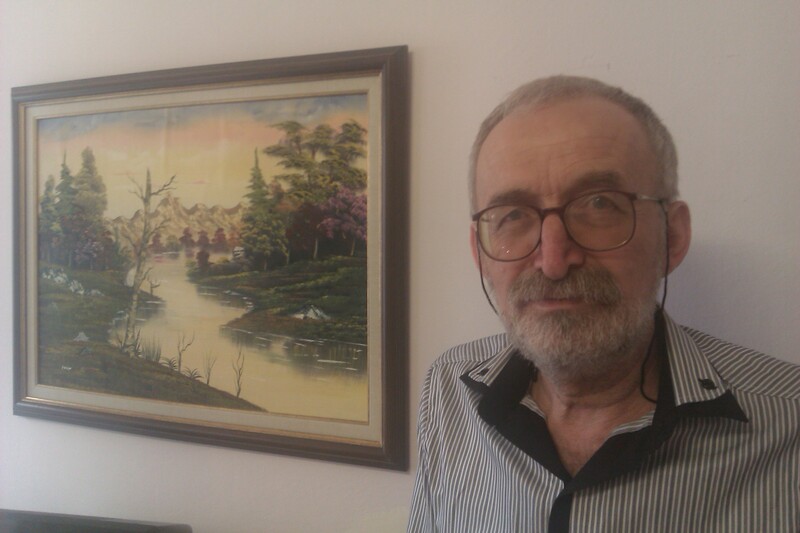 Hüseyin Aykol in his office in Ankara. The painting was made by one of his journalists in prison and sent to him. Click to enlarge. The magazine Hedef (Goal), owned by the same publisher as Özgür Ülke, is being printed that same day, 3 December 1994. If he’s quick, he suddenly thinks, he can get the news about the bombing of Özgür Ülke into it before it’s printed. After that’s being done, he doesn’t know what to do. A few hours later his colleague Gültan Kisanak finds him. She gives Aykol an address on the phone: ‘get there, we are setting up the paper’. Our newspaper, which the most authoritative representatives of the state targeted and sought any excuse to close down, was one of the most important items on the agenda of the National Security Council gathered on Wednesday. The things that were said during this meeting where the decision was taken to close down our newspaper appeared in the press without mentioning the name of our newspaper. National Security Council’s decision as to what was to happen to our newspaper had become apparent 3 days later and Ozgur Ulke was bombed. It’s indescribable what Aykol feels when he sees that paper on sale at the kiosk. Yakut Yilmaz lets himself down onto the red tiled pavement, right in front of the distribution office of Özgür Ülke in Diyarbakir. His legs can no longer carry him. It’s icy cold this early December morning but he doesn’t feel it. He is crying. The paper. The paper has been bombed. One question keeps running through his mind in a panic: how on earth are people going to find out the truth now? To him, the truth is Özgür Gündem. The paper, which has had fourteen different names over the years because of publication bans and fines and is now being published again under its original name, started in 1992 as the first one to report on the Kurdish issue. Kurds officially don’t exist in Turkey, their language is forbidden, like any expression of Kurdish culture. In the Turkish media nationalism reigns supreme, problems in the south-east of the country, mainly inhabited by Kurds (‘mountain Turks’), don’t get any attention. The coming into existence of papers like Özgür Gündem and several weekly and monthly magazines of the same publisher, is directly connected to the establishment of the PKK in 1978 and the first attack by the group in 1984. The PKK was a Marxist-based separatist group in those days. The goal was to be reached with violence, but also with a growing Kurdish conscience. The last Kurdish uprising in Turkey was in 1938 in the province of Dersim and was brutally suppressed, the assimilation of the Kurdish people is in full swing and many Kurds are not even aware of their identity, let alone of the marginal position of their segment of society. The PKK is changing that. The organisation doesn’t hide in its training and base camps in Syria and Lebanon, but sends representatives to Kurdish regions to win support and recruit new fighters. In that way it manages to get into the veins of Kurdish society – and become the leading Kurdish power. 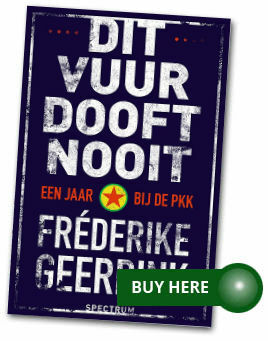 Whoever wants to turn the newly won Kurdish identity into, for example, political or journalistic action, can do that only with implicit support of the PKK. Division among Kurds is forbidden. With division, you won’t win the war. And the war is intense. The state approaches the violence of the PKK purely as a terrorism problem – a Kurdish issue after all doesn’t exist. It’s hard against hard. And not only between the PKK and the Turkish army. The army burns down hundreds of Kurdish villages, forests and agricultural lands in an effort to rob the PKK of its hide-outs -and supply points. The villagers can choose: leave, or become ‘village guards’, in other words help fight the PKK with arms supplied by the state. A stream of refugees to the cities – Diyarbakir, Istanbul, Adana, Izmir – starts. The Yakut family flees from the hamlet of Kulboga to Baglar, a district in the heart of Diyarbakir. Within a few years Baglar becomes over-populated, the unemployment and poverty are overwhelming. Anyone who is politically active in those years and supports the PKK or is suspected of supporting it, will inevitably end up in trouble. Jitem, the secret death squads of the army, carries out hundreds of extra-judicial executions and dump the bodies in wells, rivers and valleys. Thousands of Kurds are being locked up – the prison of Diyarbakir, where the torture is so severe it often leads to death – is one of the most notorious in the world. The PKK is killing too: it doesn’t only fire on military targets, but also civilian ones and gets rid of opponents within its own ranks. Özgür Gündem reports these matters from the Kurdish perspective. From the PKK perspective. The PKK doesn’t directly interfere with the content of the newspaper, but the paper always gives consideration to its message. And very directly too: if the PKK has something to share with the world, then they deliver their statements to the paper and like-minded magazines, which often publish them in their entirety. So the term ‘mouthpiece for the PKK’, as Kurdish media are often described by the Turkish state, is somewhat justified. At the same time the term reduces the papers to nothing more than that. Unfairly, because Özgür Gündem surely engages journalism, brings news and backgrounds that can’t be read anywhere else and gives the Kurds the voice they never had in Turkey. For Yilmaz, Özgür Gündem is the truth. But it’s not only for that reason that he keeps on distributing the paper. They can arrest and torture him hundreds of times, but they can’t stop him. And if he is in pain, if he has an attack of epilepsy, worsened by the beatings, occurs and he just falls down on the street, if he doesn’t succeed in escaping from the police in the small backstreets of his city and he is flogged again, he thinks of the fighters in the mountains. He reads about them in the paper. They are having a hard time. He isn’t. If only he could have joined the PKK. If only he had been healthy. Then they wouldn’t have rejected him when he stepped forward to fight. A PKK fighter with epilepsy, he knows it can never be, but still… They urged him to keep supporting the Kurdish struggle in the city. He takes that task seriously and won’t disavow it under any circumstances. One of the PKK fighters he often thinks of is his brother and fellow newspaper distributor, Nihat. He swapped his job in the city for a life as a guerrilla in the mountains, just like nine other young men from the Yakut family. Mevlude quarelled with her sons sometimes. Nihat, her oldest, distributed papers and dragged his younger brother Yilmaz along with him. What was wrong with Yilmaz’ job at a leather company? Why did he, an epileptic, have to deliver newspapers too? More often than not they came home damaged, if they came home at all, but rather spent the night in a police cell. And what were the piles of newspapers doing in her house? What were they doing that was apparently bothering the police so much that they entered the house by force every now and then, turned everything upside down and banged her sons with their heads against the wall until they bled? Nihat has told her about what’s in the paper. She can’t read herself, especially not Turkish, since she speaks only Kurdish. The backgrounds, the history, the uprising, the politics, she doesn’t really understand. But Nihat convinced her that he is doing it all for the freedom of their people. That he will continue doing that and that nobody, not even his mother, can change his mind. So now Mevlude supports her sons. When they leave the house in the morning to distribute the papers, she throws water after them. It protects them against misfortune. Yilmaz Yakut. Behind him portraits of Kurdish journalists who were killed. Click to enlarge. Yilmaz is still alive. There have been a few close shaves. The police threatened so often to kill him if he didn’t stop distributing the paper, but they didn’t succeed. Also in March 2006 Yilmaz had a narrow escape. There are clashes lasting for days between the police and the inhabitants of Baglar. It’s one of the areas where Yilmaz distributes papers, and clashes or no clashes, he delivers them. He gets arrested and his family only sees him again four days later, when he faces a judge. He is in a worse state than ever before. His jaw is broken and dislocated, his head is bleeding, there is blood coming out of his ear. His clothes are drenched in blood. Yilmaz is set free. Mevlude and her sons take him to hospital. When he has recovered enough, they take him home. She feeds him with yoghurt and crushed biscuits. Nihat is dead. They only heard ten months after he lost his life in a battle with the army, in November 1998. His remains were never buried, just left in the mountains. Another eight members of the Yakut family who joined the PKK didn’t survive. Of them, only Hikmet and Ihsan have an official final resting place. The tenth Yakut that fought with the PKK, Beyazit, was arrested and is serving a long prison sentence. Nine months after the mass arrests, the trial against 44 Kurdish journalists starts. The biggest trial against press freedom in the history of the Turkish republic. 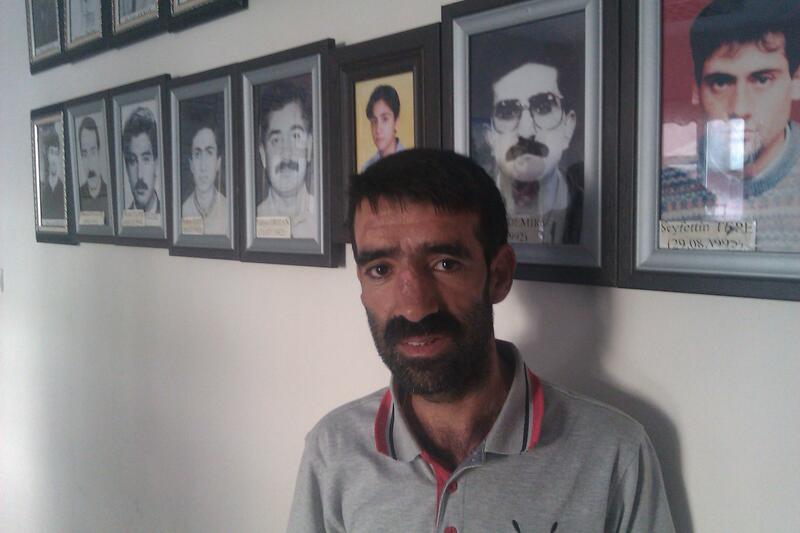 For Hüseyin Aykol, December 1994 and December 2011 are indissolubly connected to each other: both the bombs and the trial are meant to silence the Kurdish press. In the bombing one colleague died, but over the years 76 people working for the paper either as a journalist or distributor were murdered. Özgür Gündem had many publication bans, the last in March this year. Also the millions of liras of fines sometimes forced the paper to close down temporarily. The ones that tried to silence him and his colleagues are still the same. At the end of November 1994 it was Prime Minister Tansu Ciller who signed the document of the National Security Council to ‘eliminate’ Özgür Ülke, in the wording of the eventually revealed document. And now, in 2012, it was Prime Minister Erdogan who admitted to having a deal with the judiciary to silence politically active Kurds: ‘If you deal with them judicially, we will do what’s necessary in parliament’. But they are not successful. Also on 12 December 2011, the day after nine Özgür Gündem journalists were taken into custody and computers and other stuff were seized, the paper was back on the newsstands. Just like on 4 December 1994, the morning after the bomb. Other independent papers put their equipment at Özgür Gündem’s disposal and in no time they made a paper. A paper of, just like then, four pages. ‘Hey, Yilmaz, are you there again?’ Yilmaz’ colleagues call out when he arrives at work. ‘You don’t have to come in to work, you know that don’t you?’ They get him a chair, he’s so unstable on his feet that they can hardly bare to look at him. Yilmaz smiles, and says: ‘It’s my job. I take that seriously, you know that.’ His dentures and his badly healed jaw make it hard to understand him these days. He drinks the tea his colleagues give him. ‘It’s good to see you here’, says colleague Tahsin. ‘Just as it was good in the old days to see you come around the corner again with your hand cart with its secret stash of papers. But please, take a rest, you deserve it’. But Yilmaz is unstoppable. When he finishes his tea, he gets up. He walks to the depot of the parks and gardens department of the Diyarbakir municipality, gets a watering can, fills it with water and sprinkles the lawn. His colleagues are watching from a distance, shake their heads and smile. Delivering papers was no longer possible. Oh it was sweet to be able to distribute them openly after in 2002 the state of emergency was lifted in the whole of Southeast Turkey and distributing the paper was no longer illegal. But his epileptic attacks have become so serious that it would be irresponsible to carry on. What if he had a seizure outside his own neighbourhood, where people may not know him and wouldn’t know what to do? His colleagues at the parks department know exactly what to do, they keep an eye on him. Yilmaz’ job basically only exists on paper. The Diyarbakir municipality, for many years governed by pro-Kurdish party BDP, has a special programme for people who became disabled while contributing to the Kurdish struggle. Yilmaz was eligible. The parks and gardens department hired him. He doesn’t really have to show up, and his illness and handicaps also hardly allow him to. But Yilmaz comes in on the days he feels well enough. He waters the flowers and picks the weeds. He owes it to his people. That’s how he feels. * Ape Musa’nin kücük generalleri (The little generals of Ape Musa), by Nihat Hikmet Senol, Aram publishers, 2008. * Susturulamayanlar (The ones that can’t be silenced), by Hüseyin Aykol, Aram publishers, 2012. This brings very grim and dark memories for me personally. As a Kurd from South Kurdistan (Duhok) living in the refugee camp in Amed (Diyarbekir), at the age of 10 years, I sold Kurdish music (Shivan Perwer & Ciwan Haco) which was illegal at the time, among other hand-made items that included red, green, and yellow colors of the Kurdish flag. I owned a shoulder-strap wooden box to carry my shoe-shining brush and paints. At the bottom of the box, there was a hidden pocket the held my “illegal” items. I was captured several times while trying to make cassette sells to undercover agents. Each time, they would slap me a couple of rounds, break the cassettes, and take my box, and then release. A couple of times, I wasn’t so lucky though. When I was captured by the same undercover agent, I was taken on all the occasions to a police station and beaten and tortured. When I was captured by the same agent (who his friends called Mehmet) for the third time, he promised that I would not take my earnings to my family and that it would be the end of me. He grabbed my wrist, while beating my head. As we reached the door to the police station, he positioned me in front of himself, and kicked me so hard, like kicking a football, that I lost my breath for nearly two minutes. He handed me to the police officer and told him to hold on to me very tight. I could see the policeman being disgusted as the agent took real enjoyment forcing and holding out my arm, while lighting his cigarette lighter under my hand-lit. When Mehmet left after I passed out, the police officer who was in charge, freed me and asked me to not go into the city of Amed for a couple of months and that I didn’t do. Just like Yilmaz, I bought another box and more tapes and only changed the neighborhood that I conducted my patriotic duty. It was never about the money.